Download the JJR5000 technical catelog in PDF. and pharmacy and so on. Pump: make use of soft stop function to relieve the influence of water hammer so as to save system maintenance cost. Ball mill: make use of voltage ramp startup to reduce gear torque friction so as to save cost and time. Fan: reduce belt friction and mechanical conflict to save maintenance cost. Compressor: make use of current limitation function to realize smooth startup so as to reduce motor heating and prolong its service life. Conveyor: make use of soft start to realize smooth and gradual startup process in order to avoid product move and liquid overflow. Three kinds of optional starting parameters are available for one soft starter to drive different motor load. Dynamic fault record function which is convenient for seeking the reason of fault. 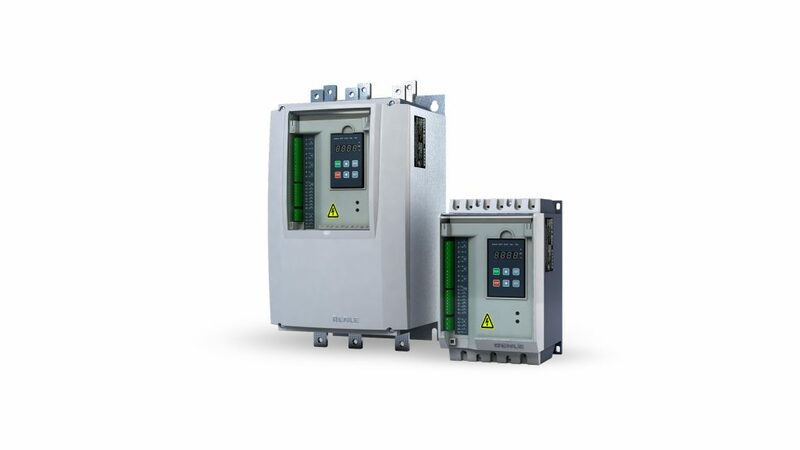 Multiple protection functions: over current, three-phase current imbalance, overheat, phase loss and motor overload protection. Powerful software functions and many kinds of hardware to easily satisfy different site application request. Two communication protocols are optional: Profibus / Modbus. Reasonable structure design to make installation easier and use more convenient. Humanization designed operation mode. Display window is optional: LED or LCD. Menu tree is grouped by function in order to make operation easier.